There’s no time more magical than Christmas and perhaps one of the most cherished memories for any parent is seeing their child perform in their first Christmas play. There’s something about those wide-eyed angels, tea-towel-headed shepherds and grubby-faced kings that makes you realise the true spirit of Christmas lies somewhere in the innocence of these small children. But before we get too misty-eyed, let’s not forget that behind every charming performance there toils a dedicated team of nursery staff! "I love Christmas. I love everything about it – from the gaudiest baubles to the glitteriest bit of tinsel and I always look forward to Christmas at the nursery. The rest of the staff laughs at me because I try to get everyone started really early and they moan that they have to ‘feel’ Christmassy first. Well I suppose October is a bit early … no, just kidding! Seriously, though, you see so many Christmas plays with the pre-schoolers not really knowing why they’re standing on the stage dressed as a star or a sheep that I like the idea of trying to prepare the children beforehand – but then it’s a fine line between ‘over’ rehearsing them and losing some of that ‘fresh’ appeal as well. So, putting on a Christmas play; where do I start? OK, I usually begin by deciding with my team what kind of show we’re going to put on that year. We’re only a small nursery and we know each other really well now, so we’re usually in agreement. We tend to alternate between a set ‘traditional’ nativity with a narrator telling the story of the birth of Jesus and the children miming on stage, and choosing a slightly different Christmas play published for pre-school teachers. There’s loads of places you can get ideas. The Internet is very good of course, with some sites providing themed ideas, outlines of stories, or advertising ready-made scripts you can buy. But I find that children’s story books also provide some inspiration for variations on a theme. Or what’s really nice, is if you chat to the children and you come up with a theme together. One time we took an idea from something one of the children said and did a version of the nativity but from the viewpoint of the donkey (who carried Mary)! Once we have the idea, its plain sailing really. Well by ‘plain sailing’ I mean general panic and mayhem…no, but it does kind of take on a life of its own. 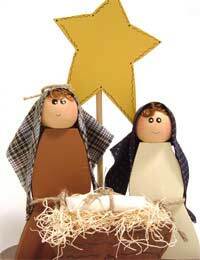 We start to familiarise the children with the Christmas Story and maybe roll-play a little bit using our nativity set. We also ‘theme’ our book corner so that the children are able to look at Christmas stories told in lots of different ways and talk about it in Circle Time. Then we decide which children might be happy in which roles. We want to involve them all and also give their parents the joy of seeing them on stage – whilst also realising that some love that kind of activity whilst others feel shy and may not enjoy it. We try to watch out for these children, as there it can be quite an overwhelming experience to suddenly have lots of grinning faces staring at you - and it hasn’t been unknown for the play to be interrupted by sudden loud crying! The bit I like the most is getting the costumes together. I love involving the children in deciding how they want to be dressed and its amazing the things they come up with that Mary might be wearing at the time! Or even the animals…One year we had the stable animals standing around the manger wearing sunglasses because one little boy was certain that otherwise Jesus would be too “bright” – priceless! OK – so in the last week before the show we practise a lot. From experience I’ve learned not to start this too early, as too much practise seems to confuse the children just as much as too little. But what we aim to do is basically make sure all the children know what part they’re playing, when they come on, where they stand and what they do. Sometimes it works, sometimes it doesn’t, but the main thing is that they all have fun and the parents do too. The most special thing about our nursery Christmas play? Hmm, that’s a hard question. I was going to say seeing the children being proud of themselves afterwards, but you know what? I think it’s the moment I look out at the parents watching and see their rapt expressions of adoration and then the first of the Mum’s wipe a tear away. Each year it seems incredible and the moment I love my job the most. See – I’m getting soppy. I told you I love Christmas – it’s magical!"